At last weekend on April 4-5, 2019, the ambassadors and madams of about a dozen countries in Korea had a rare opportunity to take a look into what happened between Korea and Japan 1,600 years ago. The Festival is to honor Dr. Wangin (known as Wani in Japan), a scholar from the Baekje Kingdom of Korea (18 B.C.-660). Wangin brought The Analects of Confucius to Japan, where he spread Confucian canon and Chinese characters. He also taught the son of Japanese emperor Ojin. The four-day event features fireworks, a traditional Korean culture show, a musical about the scholar's life and other attractions. Ambassadors and leaders of the Yeongam County join the mayor and other leaders of the Yeongam County in officially opening the 2019 Yeongam Dr. Wangin Culture Festival. According to Wikipedia, Dr. Wangin (Wani in Japanese phonetic and also Wani, Wani Kishi (王仁, 和邇吉師)) is a semi-legendary Korean scholar of the Chinese classics who is said to have been sent to Japan by the Baekje Kingdom in the southwestern region of Korea during the reign of Emperor Ōjin of Japan. He used to be associated with the introduction of the Chinese writing system to Japan. In the 15th year of the Emperor Ōjin (404 A.D.) in August, the King of Baekje of Korea dispatched Achiki to Japan. Prince Uji-no-Waki-Iratsuko took him as his teacher. Now, the Emperor inquired to Achiki, saying, "Is there any scholar superior to you?" He replied, "There is a man called Wani (Wangin in Korean). He is excellent." Mayor Jeon Dong-pyung of Yeongam County speaks at the opening ceremony of the 2019 Yeongam Dr. Wangin Culture Festival. Then, the emperor of Japan dispatched Aratawake and Kamunagiwake (a male oracle), who were ancestors of the Kamitsuke-no-Kimi clan, to Baekje, to invite Wani to Japan. This Achiki is the progenitor of the Achiki-no-Fubito clan. In the 16th year, in spring, in February, Wani came to Japan. Then, Prince Uji-no-Waki-Iratsuko took him as his teacher, learned various classics under him and there was nothing he didn't become thoroughly acquainted with. Wani (Wangin in Korean) was the progenitor of the Fumi-no-Obito clan of Japan. 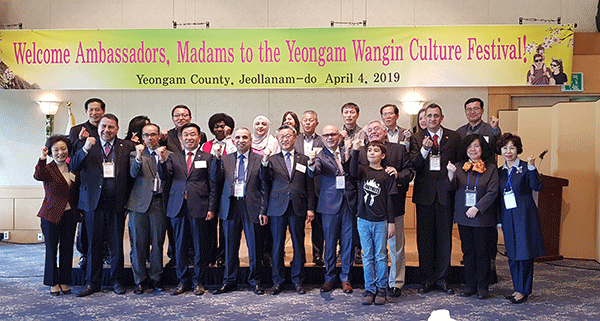 At the invitation of Mayor Jeon Dong-pyung of Yeongam County of Jeollanam-do Province, the ambassadors and other senior members of the Seoul Diplomatic Corps visited the County with their spouses to attend the 2019 Dr. Wangin Culture Festival that lasted for four days. Mayor Jeon Dong-pyung of the Yeongam County (10th from right) opens the 2019 Wangin Culture Festival on April 4, 2019 with the attendance of the representatives of the Seoul Diplomatic Corps and other leaders of the County. Attending the tour included Ambassadors Rodolfo Solano Quiros of Costa Rica, Adel Adaileh of Jordan, Mihai Ciompec of Romania, Difie Agyarko Kusi of Ghana, Virgilio Paredes Trapero of Honduras, Daul Matute Mejia of Peru, and Ambassador Dinara Kemelova of the Kyrgyz Republic. There also were Mrs. Tran Thi Lan Hinh (spouse of the Vietnamese ambassador) and Defense Attache Mario Gutierrez of Mexico and Carlos Martinez of Venezuela with their spouses. 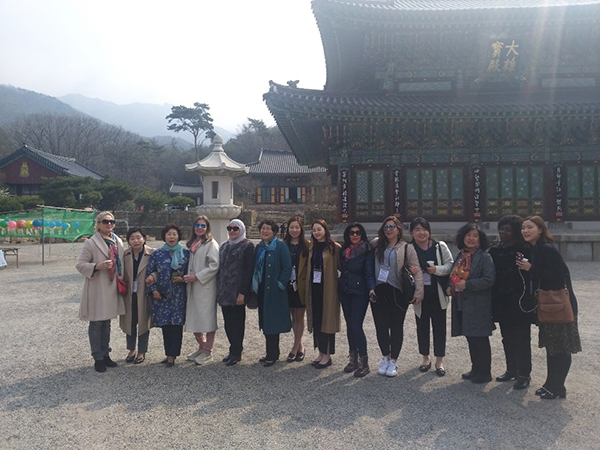 It was a one-night-two-day tour and the visiting ambassadors and senior diplomats enjoyed the hard-to-come-by chance to personally exposed to the history and genuine Korean culture of the past dynasty. Traditional Dance Team of Korea presents performance at the 2019 Yeongam Dr. Wangin Culture Festival. The occasion also offered a rare opportunity to the ambassadors and madams to meet with the provincial government leaders and noted civic figures from all walks of life, including culture and arts. Among the Korean dignitaries attending the opening ceremony and taking part in the historical-cultural activities were Governor Kim Young-rok of the Jeollanam-do Province, National Assemblyman Suh Sam-suk (a member of all-important Assembly Budget & Accounting Committee), Chairman Cho Jung-ki of the Yeongam County Assembly, Wangju District Court Chief Park Byung-chul, and Chief Prosecutor Park Kyun-taek of the Gwangju High Prosecutor’s Office—along with the chiefs of other legal and law-enforcement agencies of the province. Mayor and Mrs. Jean Dong-pyung of Yeongam County of Jeollanam-do Province (6th and 7th from left, front row) pose with the visiting ambassadors and their spouses on April. 5, 2019. There also Commander Lee Seong-yeol of the Third Naval Fleet of the Korean Navy and Commanding General Soh Young-min of the 31st Republic of Korea Army. There also were the director of the Japanese Culture Institute and also Chinese Consul General Tsuen Hsien-wi in Gwangju, and Korea’s Human Cultural Asset Yang Seung-hee who came there to present traditional Korean Gayageum Music. Then there were Chief Abbot Ven. Wol Woo of the Daeheung-sa Buddhist Temple in Haenam along with members of the Jeollanam-do Provincial Assembly. Ambassador Rodolfo Solano Quiros of Costa Rica (left) presents a Plaque of Citation to Mayor Jeon Dong-pyung of the Yeongam County on April 5, 2019. Amb. Solano Quiros was the dean of the visiting members of the Seoul Diplomatic Corps that day. Then were introduced leaders of the Harakata City of Japan as well as local city mayors including Mayor Shigeyuki Matsumoto of the Kanzaki City of Japan. There also was a Plaque of Appreciation presentation ceremony where Ambassador Rodolfo Solano Quiros of Costa Rica, dean of the visiting members of the Diplomatic Corps at the time, presented the Plaque to Mayor Jeon Dong-pyung of the Yeongam County. The remarks in the plaque cited by Ambassador Solano Quiros read: “I present this Plaque of Appreciation to Honorable Mayor Jeon Dong-pyung of Yeongam County on behalf of the visiting members of the Seoul Diplomatic Corps for the invitation of us to the 2019 Yeongam Wangin Cultural Festival on April 4-5, 2019. The occasion greatly contributes to our understanding of the city as well as promotion of friendship and cooperation between Korea and our countries.” It was obvious from the atmosphere of the meeting as well as the attitude on the part of the honored that presentation was highly appreciated. Mayor Jeon Dong-pyung of the Yeongam County (right) and Ambassador Rodolfo Solano Quiros of Costa Rica deliver a speech to the guests. We, the descendants of Dr. Wangin, have been working very hard, inheriting the spirit of his communication and win-win spirit, to achieve the common aims of affluence and welfare. Today we are here cherishing and refreshing the noble spirit of Dr. Wangin and sharing the time together. Mayor Jeon Dong-pyung (right) shows the promotional literature of the Kyrgyz Republic presented to him by Ambassador Dinara Kemelova of Kyrgyzstan. 1,600 years ago, Dr. Wangin visited Japan and made great contributions and made great contributions to the development of the Asuka Culture of Japan. The Wangin Culture Festival is the condensation of history and culture, and has been designated as the Promising Festival of the Republic of Korea for the fifth consecutive year..
And the Festival has firmly established its status as the Representative Personality Festival of the Republic of Korea. Ambassadors and their spouses pose in front of the sculpture of the Dr. Wangin during their visit to the country on April. 4, 2019 to take part in one of the most important cultural festival of the Republic of Korea. Festivals gain popularity when they are observed all together. It is the very win-win spirit of communication of Dr. Wangin that a festival must be enjoyed by everyone without anyone excluded from it. All of you present here are the very masters of the Wangin Culture Festival! There is a program of a total of 84 interesting, colorful events to take place throughout the Festival Period. 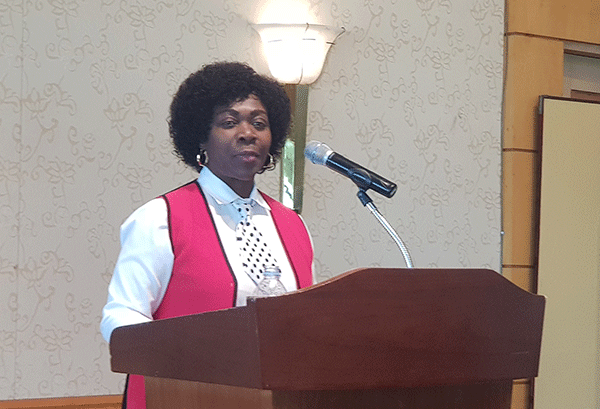 Ambassador Difie Agyarko Kusi of Ghana offers a toast to the guests. The mega parade of the ‘Director Wangin Goes to Japan’ is the representative program which is participated in by a total of over 5,000 county citizens and musical performers. The Galgokdeul Songs, Samho Ganggang Sullae Ring Dance, Dopo Jejul Darigi Game are the three major traditional folk games of the Yeongam County. There are a plenty of interesting programs in store for the Yeongam Culture Festival, which include the presentation of songs by the representative artists of Korea, including National Songstress Dr. Ha Chun-ha and other national top-rate singers such as Kim Kyung-ho, Kim Beom-su, Chang Yun-jeong, and Soh Hyang present congratulatory performances and live music shows. Ambassador Mihai Ciompec of Romania proposes a toast to the guests. The Yeongam County Ha Jung-ung Art Hall will host a Special Exhibition which is expected to fully meet the expectations of the visitors as well as the art lovers. There will also be a Special Exhibition of Pottery Works in celebration of the 20th anniversary of the opening of the Yeongam Pottery Museum. It is my ardent desire and wish that all our distinguished visitors to the Wangin Culture Festival will make and take home the fondest and beautiful memories of all the wonderful events and things of our County during your stay here in the midst of the enticing fragrance of the cherry blossoms. Ambassador Daul Matute Mejia and Mrs. Gabriela Blanco De Matute of Peru (facing the camera) try a cup of traditional Korean Bokbunja raspberry wine together with other visiting members of the Seoul Diplomatic Corps. Honorable Guests, Ladies and Gentlemen. On behalf of the visiting members of the Seoul Diplomatic Corps, as well as for myself, I would like to express my profound gratitude for inviting us to attend the wonderful 2019 Yeongam Wangin Culture Festival here this evening! Deputy Mayor Son Jum-sik of the Yeongam County (6th from left, front row) poses with the visiting members of the Seoul Diplomatic Corps on behalf of the mayor who was away on a mission beyond his control. On his right is Ambassador Rodolfo Solano Quiros of Costa Rica, dean of the visiting members of the Diplomatic Corps that day. It is my great honor and privilege to share this words with you; here in South Jeolla Province, on the occasion of the 2019 Yeongam Wangin Culture Festival. My colleagues from the Seoul Diplomatic Corp and I feel very honored by the fact that we are here today to participate in the “2019 Yeongam Wangin Culture Festival” which is regarded as one of the biggest and most impressive cultural festivals in Korea. We would also like to express our gratitude and high appreciation to the Mayor Jeong and Yeongnam county’s officials for their warm hospitality and for inviting us to this memorable festival and through it giving us a chance of interacting with the people and authorities of the South Jeolla Province and Yeongam County! From left to right:Ambassador Daul Matute Mejia of Peru, Manager for Livestock Industry Moon Gil-man of Yeongam County, Defense Attache Mr. Mario Gutiérrez of Mexico, Mrs. Laura Vanoye, spouse of the defense attache of Mexico, Mrs. Tran Thi Lan Hinh, spouse of the ambassador of Vietnam, Manager for Urban Development Moon Dong-il of Yeongam County, Reporter Sua Kim of The Korea Post. Once again, I would express my heart-felt gratitude to the Excellencies and Madams and other distinguished diplomats for their attendance at the 2019 Wangin Culture Festival in the Yeongam County. Thanks to the personal attendance by the distinguished members of the Seoul Diplomatic Corps, we, all the descendants of Dr. Wangin, feel honored and grateful no end and feel very proud of the presence of the distinguished international dignitaries. Thanks to the attendance of Your Excellencies, we are confident that we have attained a great success and made great achievements from hosting the important festival this year. 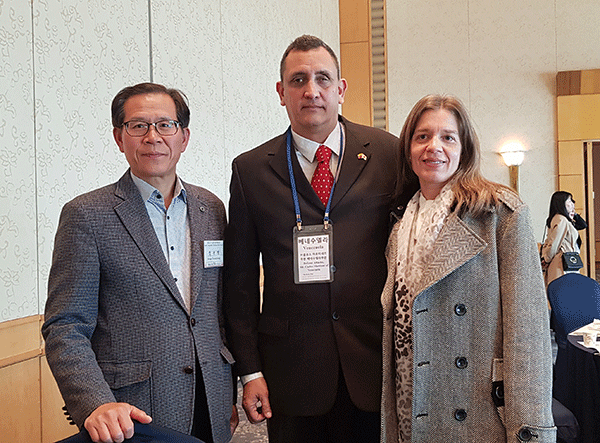 Lieutenant General and Mrs. Carlos Martinez of Venezuela (center and right) pose with Manager Jung Chan-myung of the Argicultural Technology Center of the Yeongam County. The Yeongam County is noted for the Wolchul-san Mountain which was designated as the National Park of the Republic of Korea along with the thousand-year-old Dogap-sa Buddhist Temple and various historical sites of Dr. Wangin. Thus, Yeongam is noted for many ‘living’ historical assets of great importance. It is my sincere hope that the Excelencies and Madams, together with other distinguished international guests, will continue to take warm interest and regard for our county as well as the Festival and help us be exposed far and wide to the entire world. And, most important, I express my warm and strong desire that the Exccellencies and Madams will again favor us with your kind attendance next year. I offer my prayers for the endless development and growth of the countries of the distinguished guests and at the same time I would like to offer my prayers for the boundless happiness and love to the families of all the distinguished diplomats who kindly attended our Festival this year. Again, I offer my profound gratitude for the kind attendance of the Excellencies and Madams at the 2019 Wangin Culture Festival in our county. Mrs. Tran Thi Lan Hinh (spouse of the ambassador of Vietnam) and Mrs. Kloos Flavia Athena (spouse of the ambassador of Romania), foreground and left, respectively, sign their names on the roofing tiles at the Temple, to used in an expansion or reconstruction of the temples. Do you know Dr. Wangin (Wani in Japanese language) who is considered the unforgettable teacher for the 130 million Japanese people? He is rated to be the founder of the famed Asuka Culture of Japan and Dr. Wangin. Distinguished guests, from within Korea and without, and the tourists! Welcome to the 2019 Wangin Culture Festival. I extend my hearty gratitude to all the distinguished guests attending this Festival! Visiting members of the Seoul Diplomatic Corp and the reportarial team of The Korea Post media pose in front of the famed Dogapsa Buddhist Temple. Yeongam, wherein is situated the famed National Park Mountain, Wolchul-san, is a city of history, culture and tourism, which dates back to the brilliant Mahan Culture that flourished in 2,300 years ago, and beautifully co-exists with the ultra-modern technology, including an F-1 ultra-modern international motor race course. The Yeongam County is well known for the world’s top-rate shipbuilding technology and the future-oriented food-beverage industry. This is where the Wangin Culture Festival, a traditional Korean cultural festival, takes place. Ambassador and Mrs. Adel Adaileh of Jordan stand in front of a kiln where ceramic works are baked for longevity and beauty. This year marks the 20th anniversary of the Wangin Culture Festival and the great aim of the organizers of the Festival is to develop it into a world-famous global festival—far beyond the realm of the Korean peninsula. We have prepared a wide variety of celebration programs that can be enjoyed by everyone with an eye to developing it into a premium festival, safe festival, and economic promotion-oriented festival—which can be enjoyed by all and everyone. Seoul Diplomatic Corp and the Staff of the Yeongam County are taking pictures at the cherry blossom street in Yeongam. The Wangin Culture Festival continues for three nights and four days when you can enjoy to your heart’s content the quintessence of the Southern Provincial Culture and Art at one place. In particular, today we are graced here with the presence of many distinguished guests from home and abroad who came all the way down here to grace our Festival with their attendance to celebrate the Festival together with us. Spouses of Ambassadors are pose with The Korea Post Reporter team at the Dogapsa Temple.